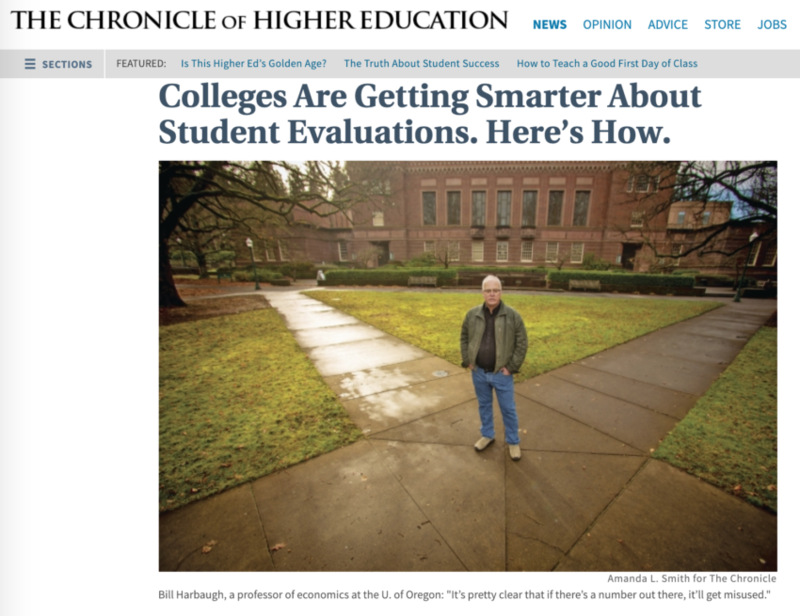 Emily Wu and Kenneth Ancell, two students at the University of Oregon, approached their honors research professor, Bill Harbaugh, a few years ago about studying the relationship between student evaluations and grade inflation. Harbaugh, a professor of economics, was enthusiastic. Wu and Ancell dived into the university’s extensive data on evaluation and transcripts, focusing on its two largest schools, journalism and business. He did. In the spring of 2017, Harbaugh assembled a task force on the issue and invited Sierra Dawson, now associate vice provost for academic affairs, to join. Doing nothing to revise or phase out student evaluations could be a risky proposition not just educationally, but also legally. In August, an arbitrator ruled that Ryerson could no longer use student evaluations to gauge teaching effectiveness in promotion-­and-tenure decisions. The Ryerson Faculty Association brought the arbitration case and argued that because of the well-documented bias, student evaluations shouldn’t be used for personnel decisions. Tagged course evaluations. Bookmark the permalink. Bill, can you provide a link to the research that shows evaluations are biased? SET are biased against female instructors by an amount that is large and statistically significant. The bias affects how students rate even putatively objective aspects of teaching, such as how promptly assignments are graded. The bias varies by discipline and by student gender, among other things. It is not possible to adjust for the bias, because it depends on so many factors. SET are more sensitive to students’ gender bias and grade expectations than they are to teaching effectiveness. Gender biases can be large enough to cause more effective instructors to get lower SET than less effective instructors. I’m sure Bill has lots of other links – my quick queries on the googles suggest there has been a lot of effort put into studying this topic. Are those the best studies? The first study is based on demographic correlations from RateMyProf data. It’s not suited to detect causal relationships and almost certainly has data quality issues. It also fails to find a relationship between ratings and gender. The second study is based effectively on comparing the evaluations of two (!) graduate students in an online course. These are weak studies. I hope there are better studies if Bill is trying to revolutionize evaluations based on this literature. It would be especially helpful to show that the demographic groups that are most effective at teaching are those that are most likely to be discriminated against, as Bill asserts in the Chronicle piece. There is a great deal more literature; these two were linked in the article, so it seemed germane to the query. It did not appear from the article that Bill or other researchers were drawing definitive conclusions based on these two studies, but there has been an argument for some time now there is a disconnect between SET data and faculty performance and/or learning outcomes. I’ve been privy to faculty griping about evaluation processes for three decades, and the argument is not a new one. So one can influence policy these days by simply asserting there’s some ill-defined “literature” out there that supports your position? Or because an “argument” is repeated long enough? I suggest you try google scholar, or just go through the references listed in the papers linked to in this post. 1) I have casually looked. I haven’t seen much that is high quality. 2) Bill, you’re the one making these claims and attempting to have an influence both at UO and nationally. It’s too much to ask you to back up your assertions? Why are you being defensive? A couple of DOIs to the studies you having in mind would take you a few minutes. Has the old standard that evaluations of teaching should be based on multiple, convergent evidence been abandoned? Even as a numbers type person in a numbers field, I always tell my students that a number in isolation means very little. By the way, my favorite randomized studies suggest that students prefer attractive teachers of ugly ones, imagine that. Of course, these would be my favorite to put my Evals in context. Ratemyprofessors.com? Seriously? Isn’t there a better source of data we could use, like graffiti in dorm restrooms?